Transcription of Sketch in the Primitive Methodist Magazine by W.B. To realise the aid that music is to worship we have just to ask ourselves what the services of the Sanctuary would be without it. To eliminate the songs of Zion would be to take away that which has been of great service in developing the spirit of devotion. The advantage of the service of praise is that it secures the co-operation of all the members of the congregation, and enables all to take part in worship. For its success, our own church has depended very largely upon its soul-stirring hymns and tunes. In the records of the early days of the Connexion’s history, and during the great Methodist revivals, this fact is strikingly illustrated, and to-day much of our success is due to the importance we place upon congregational singing. The purpose of this article, however, is not so much to emphasise the place and influence of sacred song in worship, as to bring before our readers some of the men who are in charge of our choirs and who with great devotion and enthusiasm are rendering acceptable service to our churches week by week. A notable feature about the gentlemen whom we have selected for this paper is that their service is not confined to the musical department merely, but in many cases they are serving also as stewards, local preachers, Sunday school teachers, etc. The first whom we wish to introduce is Mr. W.E. 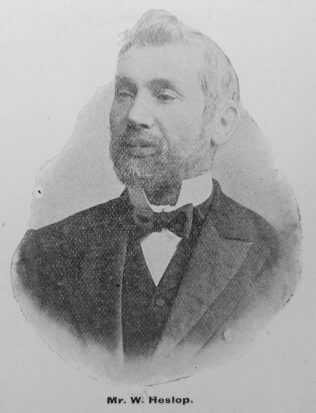 Curtis, of London, who for thirty-five years has led the united choirs at the Annual Missionary Meeting in the Metropolitan Tabernacle and the City Temple. Born in 1846, Mr. Curtis spent his early days in the Cathedral City of Canterbury. Here, in connection with our church, his father was leading singer, steward and worker in the Sunday School and Band of Hope. For six years, from the age of nine to fifteen, Mr. Curtis was in the Cathedral Choir, and derived considerable benefit from the musical training received under Dr. Longhurst, late Cathedral organist. He retains pleasant memories of Dean Alford and Dean Stanley, who were associated with the Cathedral when he was a boy. At fifteen years of age his parents removed to London, and became associated with East Street, Walworth Society, then the head of the London Fourth Circuit. For sixteen years Mr. Curtis was connected with this Church, and since 1877 he has been identified with the cause at Hamilton Road, Norwood. His services to the psalmody of the Church began when he was a lad in his teens. Having learnt at School to play the violin, he was requested to join the small band and choir at the chapel. Soon after this it was decided to form the young people of the school and congregation, into what was called the Walworth Primitive Methodist Choral Society. Mr. Curtis was the first secretary, and two years later, when he was nineteen, he received the appointment of conductor. This Choral Society was practically the church choir. His leadership of the united choirs at the Metropolitan Missionary Meeting covers the whole of this period, and Mr. Curtis regards it as a privilege, as well as a pleasure, to have been associated with this work for so many years. 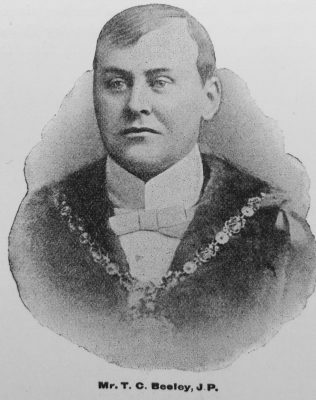 In recognition of his long and faithful services the Missionary Committee presented him at the City Temple, in 1901, with an American roller-top desk and chair, “in admiration of his personal character and in recognition of valuable service rendered for thirty-four years.” Mr. Curtis became a member of society when 17 years of age. He has officiated as teacher and superintendent of the Sunday School, society steward, circuit steward, local preacher, president of the Christian Endeavour Society, etc. Indeed, so great and varied has been the service rendered, that it is surprising one man could do so much. It speaks volumes for his love and devotion to our church and its many interests. As a musician, Mr. Curtis is known far beyond the bounds of his own church. In 1871 he became a member of the Handel Festival Choir, and he is still a member of the Crystal Palace Choir. For a number of years he was also on the Musical Council of the London Sunday School Choir, and has often acted as judge in choir contests. Coming further North, into the Darlington and Stockton District, we have a choirmaster well worth knowing in the person of Mr. William Heslop, of Darlington, the head of the choir at Greenbank Church, and the musical director of the District Psalmody Association. Mr. Heslop’s fame as a musician is not confined to his district, but is known all over the North of England, and indeed throughout the Connexion. He was born at New Shildon in the year 1839, and at an early age his musical talent asserted itself. Our friend’s first instrument was a violin, which gave place afterwards to a small harmonium, and he displayed such aptitude as to speedily become proficient with both. His father, who was a local preacher and class-leader, appears also to have had the musical talent, for he led the singing at the chapel. When but thirteen, the son was appointed to succeed the father as leader of the choir, and for half a century he has continued to officiate in this capacity. In those early days he frequently entered for singing contests, and we are told that at one contest there were three classes, chapel choir, Sunday school choir, and choral union choir, and he not only conducted the three choirs, but got first prize for them all. Twenty-six years ago Mr. Heslop was removed to Darlington by the North-Eastern Railway Company, in whose service he has been employed for 50 years. While still retaining the position of choirmaster at New Shildon, Mr. Heslop was in 1879 asked by the late Rev. Hugh Gilmore to organise a choir for the opening of Greenbank Church. This he consented to do, and for a year he held the two appointments. On the death of his father, a year later, he brought his family to Darlington, and severed his connection with Shildon. This gave him freedom to devote the whole of his attention to the Darlington choir, with the result that it was soon brought to a state of excellence, and to-day it is one of the largest and most successful choirs in our church. The connexional authorities sought his aid in the preparation of the tune book for the new hymnal, and also the Sunday school tune book, and he is now assisting in the preparation of an anthem book. Since its inception, fourteen years ago, Mr. Heslop has been the conductor of the Annual Festival of the Choirs of the district at Middlesbrough, and it is impossible to exaggerate the importance of the work he has done in this direction. He is not only gifted, but enthusiastic, and he succeeds in imparting his own zeal into all the members of the choirs. This year Mr. Heslop attains his jubilee as a choirmaster, and we are pleased to learn that the committee of the District Psalmody Association have decided to present him with a testimonial in honour of the event. Another choirmaster of note in the same district is Mr. Howcroft Riley, of Stockton. Mr. Riley is a Yorkshireman, having been born at Stanningly in the year 1844. For nearly half a century he has been in close touch with Stockton Primitive Methodism, and he and his good wife are among the few people remaining who attended the old Maritime Street Chapel. The present church in Paradise Row was erected in 1869 to take the place of the Maritime Street place of worship, and from that time to the present day, the Riley family have been found in active association with the Church. Mr. Riley became a member of the choir when a boy of eleven years, and for thirty years he has been choirmaster. In addition to fulfilling this duty at the church services, he has also trained the Sunday school scholars for the anniversary. The singing of the choir has always been a great feature of the anniversary, and probably there are no better trained Sunday school children on Tees-side. For 25 years Mr. Riley has scarcely ever missed being present at his post on Sundays, and when we remember that his place of residence is two miles distant from the chapel, we realise how devoted has been his service. Often when preparations for the anniversary have been on the way, he has made the journey three times on the Sabbath. He introduced Mr. W.H. Jude, the celebrated – composer and preacher – musician and author of “Music and the higher life,” to Tees-side. Mr. Riley is a trustee of Paradise Row Chapel, a generous supporter of its funds, and an enthusiastic worker. His choir is always kept in a high state of efficiency. As a member of the District Psalmody Association he has also rendered good service. Mr. Riley is one of two brothers, of the firm of Messrs. Riley Brothers, boiler makers, Stockton, a firm well known for its commercial integrity, and employing some hundreds of men. In the neighbouring district of Sunderland and Newcastle, perhaps the choirmaster best known is Mr. Robert Bowran, of Gateshead, leader of the choir at Prince Consort Road Church and Musical Director of the District Psalmody Association. Mr. Bowran is a lifelong Primitive Methodist, and has been connected with Prince Consort Road Church from the commencement. He is the second of eight brothers, all of whom have been connected with our church. 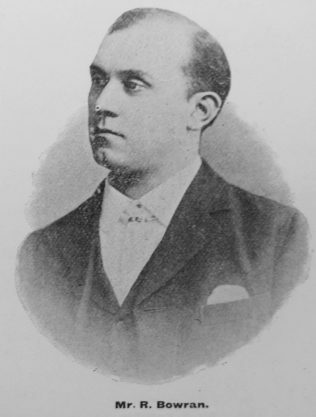 Mr. Bowran joined the choir when a boy and in his seventeenth year was called to the conductorship, his younger brother (“Ramsay Guthrie”) at the same time being appointed organist. In this sphere he has continued for nearly 20 years, and so closely has he attended to his duties that it is said he has put in more attendances at the Sunday services than any other person connected with the church. His work, too, has not been limited to the musical department, but has extended to other portions of church life and activity. He has been teacher, secretary and superintendent of the Sunday school, trustee and secretary of that board, as well as circuit steward. Mr. Bowran has also taken some part in public affairs. Three years ago he was elected a member of the School Board. He was the youngest of the 20 candidates in the field and when the poll was declared it was found that he had secured third place, coming next to the Rector of Gateshead. In more ways than one Prince Consort Road Church has gained by having such a fine choir as that conducted by Mr. Bowran. By concerts, services of song, musical services, etc., there has been raised during his leadership some hundreds of pounds for the trust fund, as much as £40 being secured for this object by a single concert. Last year the choir offered to make themselves responsible for the enlargement and improvement of the organ at a cost of £330, and, we understand, that all this amount has been raised by the choir excepting £50. In this special effort the choirmaster was greatly assisted by his brother, Mr. Thomas Bowran, the church organist, who has acted as treasurer of the fund. Mr. Bowran conducted the Praise Service at the recent National Christian Endeavour Convention at Newcastle, on Whit-Monday, and also wielded the baton at the great Praise Service at this year’s Conference in the same city. Another choirmaster worthy of recognition is Mr. Richard Annakin, of Harrogate. Primitive Methodist visitors to that fashionable inland health resort, who have attended the services at our church in Dragon Road, will agree that the musical part of the service is exceedingly well rendered, a result due in great measure to the ability and enthusiasm of the conductor. Mr. Annakin is one of a family of fourteen, nearly all of them Primitive Methodists, and he has been connected with our church from his earliest days. 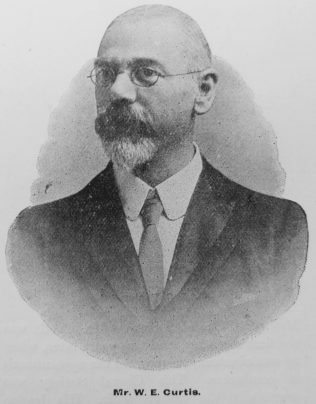 The first ten years of his life were spent at Whixley, where he was born, and later at Harrogate, at which place he was actively associated with the Sunday school as librarian, secretary, teacher of the young men’s class and finally as superintendent. He also took part in the musical services at both school and church. His career as choirmaster commenced in 1885. Leaving Harrogate for Ripon the year preceding, he became connected with the choir there. Twelve months later, on receiving an appointment in Leeds, he removed to Armley, and rendered service as teacher in Southfield Sunday school, and also as a local preacher. About this time he obtained, through application to an advertisement, the appointment of choirmaster at Belle Vue Chapel, Leeds, which position he held for eight years, only relinquishing it to take up work at Harrogate. When he began his work at Belle Vue, the choir was small in numbers and moderate in ability, but he at once organised a singing class, taught them the principles of reading and ultimately was able to gather round him a choir capable of sustaining the ordinary church services in a most satisfactory manner, as well as to give the following works (or such portions of them as can be given on a Sunday afternoon) the “Messiah,” (every year), “St. Paul,” “Judas Maccabaeus,” “Christ and His Soldiers,” “Daughter of Jairus,” “Ruth” (Gaul), “Creation,” and numerous other smaller works. On returning to Harrogate ten years age, the trustees at once offered him the post of organist and choirmaster. The choir under his careful training made good progress, and soon was brought to a state of efficiency. Besides giving a performance of the “Messiah” annually, they have also rendered most of the works previously mentioned. Last year his principal tenor gained the first prize at the Hartlepool Eisteddfod, and his chief bass and contralto took the first prize in their respective classes at Stockton Eisteddfod, and for these contests they were prepared entirely by Mr. Annakin. Although organist and choirmaster, he does not play himself, except when his deputy-organist is unable to be present, but he continues to hold the double appointment believing in one rather than two, as a general principle, as likely to produce better results with less friction. Mr. Annakin, we are told, never had but three quarters’ lessons in singing, and was 21 years old when he received them. He had about the same number of lessons on the organ when he was 32, facts which bear eloquent testimony to his natural musical ability. In addition to his services in the musical department of our church, he is also an active worker in the school, an official of the quarterly meeting of 25 years’ standing, and secretary to the trustees. The limits of this article only permit of our including one more choirmaster, and he a representative musician from Hull, that stronghold of Primitive Methodism. Mr. Arthur B. Vear, the organist and choirmaster at Ebenezer Church, Spring Bank, in that city, is a musician of considerable repute. His parents intended him for mercantile pursuits, but music – for which he has always shewn great fondness and aptitude – appealed to him, and after a course of training he adopted the musical profession. In 1895 he was called to preside at the organ of Ebenezer Church, where his efforts have met with success. Three years later he was also appointed choirmaster, so that he is in full command of the musical forces of the church – a trust, writes one of his friends, he deserves and will certainly honour. Many of his private pupils are in the choir and conspire together with him to speed the common cause. With Mr. Vear music is a means to a great end and the end is kept steadily in view. One of the secrets of his success is his genial piety and earnest care of the work of God. Another secret of his success is the blending of the energy and zeal of a true Methodist with the refinement and high ideals of a trained musician. Mr. Vear is also becoming widely known as a composer. The music of a popular cantata, entitled “The New Born King” is from his pen, besides “Nature Voices,” a cantata suitable for a floral or anniversary service, and “Sheaves of Harvest,” a beautiful Harvest Festival Cantata. He is also conductor of the Annual Choral Festival of the Hull Choirs, a position he has held for four years. William Edward Curtis; born 1846 in Canterbury, Kent to parents Thomas, a tailor, and Eliza. William married Maria Gudgeon (1840-1912) in the summer of 1869 in the Newington Registration District, London. Census returns identify two of five children. William died on 19 February 1920 at Dulwich, Surrey. 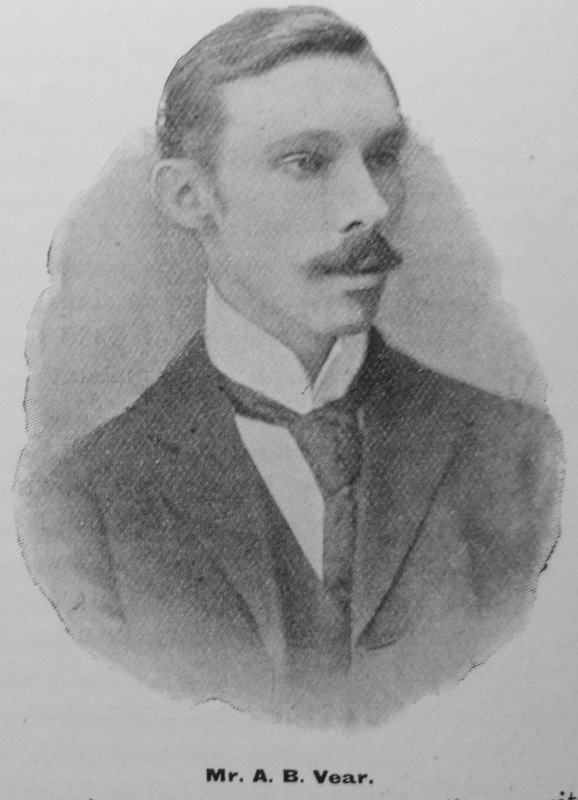 Thomas Carter Beeley; born in 1869 at Hyde, Cheshire, to parents Thomas, an engineer, and Elizabeth. The 1901 census return describes Thomas as engineer/steam/boilermaker. He married Jessie Ann Alexandra Milligan (1868-1930) in late 1895 at Bradford, Yorkshire. Census returns identify five children. 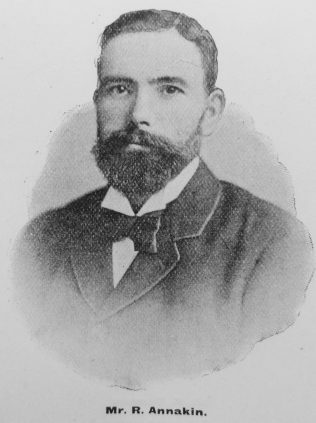 Thomas died on 9 June 1909. John Howcroft Riley; born in December 1844, and baptised on 14 september 1845 at Stanningley, Yorkshire. His parents were John, a boilermaker, and Ann. Census returns identify the following occupations for Howcroft. Howcroft married Ann Bailey (abt1848-1927) in the summer of 1868 at Stockton-on-Tees, Co. Durham Census returns identify five children. Howcroft died on 1 September 1928 at Stockton-on-Tees, Co. Durham. Robert Bowran; born 17 January1868 at Gateshead, Co Durham, to parents William and Jane. William was an engine driver at the pit. He was baptised on 1 March 1868 at Holy Trinity, Gateshead. Robert married Mary Lizzie Cruikshanks (1880-1953) in the summer of 1902 at Gateshead. Robert died on 24 October 1932 at Gosforth, Northumberland. Richard Annakin; born 1860 at Whixley, Yorkshire, to parents Robert, a labourer (1861) and later a carter and coal merchant (1881), and Hannah. Census returns identify the following occupations for Richard. Richard married Hannah Hymas (1859-1928) in late 1880 in the Knareborough Registration District, Yorkshire. Census returns identify four children. Richard married Ethel Brown (1880-1969) in the spring of 1929 in the West Ham Registration District, Essex. Richard died on 20 October 1949 at Harrogate, Yorkshire. Arthur Ben Vear; born in 1867 at Hull, Yorkshire, to parents Benjamin, a hall keeper and porter (1881), and Maria. Arthur married Ethel Maria Kettlewell (1875-1933) in late 1897 at Hull, Yorkshire. Census returns identify two children.